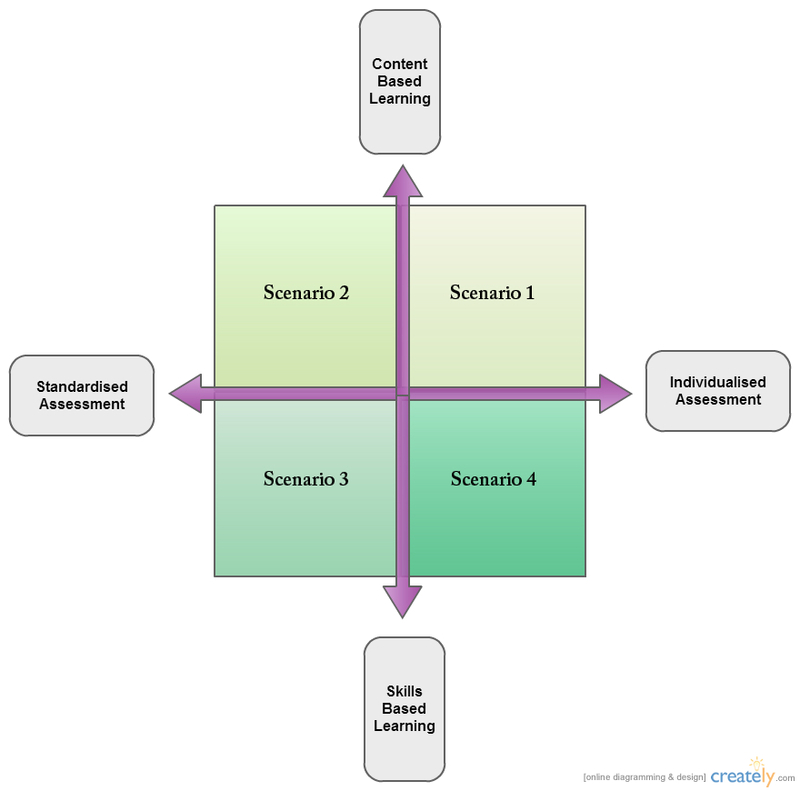 Content or Skills Based Learning: this axis is looking at whether learning will be more content or skills based in the future. In my context, this is important based on the fact that it directly effects how teachers would design their curriculum and what would be assessed in the classroom. Will the society of the future demand more skills-based learning so that the students going out into the job force are more directly prepared for their work/place in society? Or will the need for content-based education continue and perhaps grow stronger to ensure graduates have the knowledge to master certain skills later on in their careers? Standardised or Individual Assessment: this axis looks at whether the skills or knowledge will be assessed using a standardised system, as many school have today - or with a more individualised approach to suit each learner's needs. One of the more common discussions among secondary teachers is if the standards of NCEA are beneficial to our students. Of course there are pros and cons, but at the end of the day, we wonder if a national standard will inevitably leave students out and leave them at a disadvantage in their adult lives. Will we continue to try and "fit" all students into this standard? Or will there be a breaking point (or perhaps an innovation) that tips the tables and makes assessment more individualised? Will all students eventually have an IEP that can be analysed against the curriculum and assessment set accordingly?